The Superbowl is over and that means racing season is here. Nothing builds the hype of racing season like a brand new car. Visit the ArchVision Dashboard and download one of these brand new cars and take it for a test drive in your next rendering. February’s car additions feature 3 late model Chevy vehicles. Download a dark red Chevy Camaro, a fuel efficient Chevy Aveo or the all new Chevy Cruze. 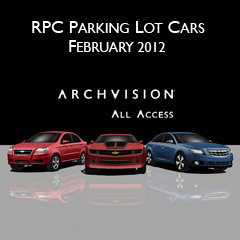 Anyone with an ArchVision Dashboard installed can download one of these beautiful vehicles, but an RPC All Access license is needed to render without watermarks.